In 1980, I was researching Army training practices in order to write a manual for junior leaders on how to train solders. I traveled to a variety of units to observe best practices. One of these was Special Forces training at the John F. Kennedy Special Warfare Center at Fort Bragg, NC. On the day I visited, trainees were being introduced to rappelling skills. About a dozen drill sergeants barked at the soldiers as they climbed the tower, learned how to tie a seat and took their first descent over the edge. It was loud, chaotic and stressful. With a challenge like that, how could I beg off? 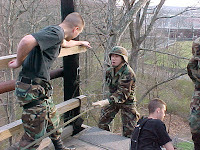 What he didn’t know was that I had mastered rappelling skills in the Army Ranger School. I had climbed 100-foot rock faces without safety ropes. I had rappelled down mountain cliffs numerous times. So I quickly walked over, tied my seat and went over the side. I negotiated the 30-foot distance in one leap, braking for a soft landing. I went to the bleachers and sat next to an old sergeant-major as I watched the trainees cope with their fear. Soon the session was over, and the sergeant-major invited me to stick around and watch the families of the cadre use the rappelling tower. This time there was no shouting, only laughter and encouragement. It was just a bunch of women and kids having fun. I watched little ten-year-old girls playfully do what 20-year-old male Special Forces trainees struggled to do. The little girls saw the rappelling tower as some kind of super-cool jungle gym. They perceived no fear at all, and so the rappelling activity was ridiculously easy. They climbed the tower over and over. They couldn’t get enough of it. What I learned from this is that fear arises from our perception of the situation, which can vary from person to person. The rappel was exactly the same challenge for both the soldiers and the families, but the soldiers had to face their fears in order to do it. They risked failure, humiliation, disqualification, and, they thought, personal injury. For those who succeeded—and not all of them did—it was a big deal. The training gave them a victory of courage and self-confidence. The soldiers who successfully completed the many months of Special Forces training would survive more challenges to their courage. In the end, they would become experts in dealing with fear—icons of mental toughness, ready for anything. I’ve faced some interesting dangers in my life. In Vietnam, I was an adviser to Vietnamese infantry soldiers. This meant that I was involved in some kind of combat operation several times a week—air-mobile assaults, search-and-destroy missions, night ambushes, and so forth. I came under fire more times than I can remember, but I don’t remember being afraid. For me, the main feeling was irritation. I was angry that someone was trying to kill us and that I would now have to deal with it. Another feeling was gratification. After all, I had been looking for the enemy, and I had found him. Mostly, I remember concentrating to manage all the activities related to close combat. I had to have a clear head to keep higher headquarters informed, assess the situation, communicate with my Vietnamese counterpart, direct movement and fire, deal with problems, request fire support or medical evacuation and manage it when it arrived. Naturally, a person couldn’t do all that if he felt fear. If fear raised its ugly head, it had to be shoved aside. Lives depended on it. Afterward, when there was time for fear, there was no longer any need for it. I remember being afraid one night in 2001. The economy had been in a recession after the stock market “tech bubble” burst. When it looked like the economy might recover, 9/11 happened, which caused confidence in the economy to tank even further. My business was to supply organizations with assessment and development resources, and funds for tools like these were the first to be cut off. Our sales plummeted, with no hope in sight. I remember thinking that something dramatic was about to happen to my company. We might even go out of business. If that happened, it would be a financial disaster. I imagined the scenarios. And yes, I felt real fear. But we focused on creative solutions and wonderful things have happened for us since then. Fear is a healthy, natural emotion. It’s a whole-body alarm to help you sense danger so you can do what you need to do to avoid loss, harm or death. I could go on, but there’s no need. A practically infinite number of things could happen in a normal life. The question is, when it happens, what will you do next? Will you act to prevent loss, harm or death? Will you take a chance to open a door of opportunity? When you feel fear, you need to pay attention to it. But then you need to quickly put fear aside long enough to assess the nature of the risk. 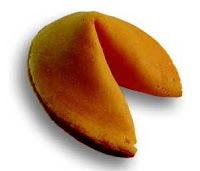 What are the chances that bad things could happen? How bad? What are your choices? What are the risks and the benefits of taking action? This isn’t always so easy. Fear can be a paralyzing emotion. But when you think about it, you’ve already found ways to deal with fear in hundreds of situations. You have the strength within you to do it again, even if the horror facing you this time is huge and dark. You can be bold as pursue your life journey. I find the words of Norman Vincent Peale comforting: "Too much caution is bad for you. By avoiding things you fear, you may let yourself in for unhappy consequences. It is usually wiser to stand up to a scary-seeming experience and walk right into it, risking the bruises and hard knocks. You are likely to find it is not as tough as you had thought. Or you may find it plenty tough, but also discover you have what it takes to handle it." Look past fear, and you'll see where the path leads. Fear is a strange thing. You fear that something bad is going to happen. Yet, when something bad does indeed happen, you are no longer afraid; after all, it's happened, the problem is here, and now you have to deal with it. If we prepare for the bad things, we no longer fear them. Scout's motto: "Be Prepared". That's why one of the biggest fears is a fear of the unknown, not knowing what is going to happen, and thus not being able to prepare for it. Yet, through scenario analysis, you can prepare for a variety of situations. Another way of dealing with fears is practice. Sure, rappelling off a cliff may be scary the first couple times you do it. But after the 100th time, it's just a simple practice. You can't be scared of the same thing after you've done it a hundred times. Thank you for sharing this - I took the quote about getting past fear and put it on my Facebook for the day (with credit to you). Outstanding article - very informative, insightful and most of all comforting and assuring.